This classic Star Trek communicator app ($.99) for iPhone, slipped past us when it was first released into the App Store at the end of May. The spot on graphics and familiar chirping sound triggered when performing the epic cover-flip to access the communicator's controls is pure goodness. This one is guaranteed to have serious old school Trekkies drooling like a Basset Hound. My favorite part of this app is that with one touch of a button a dialing pad is revealed that allows users to engage their communicator fantasies at will for making calls. Calling buddies for a beer run has never felt so incredibly satisfying. This app is dangerously authentic and it's actually useful too. Unfortunately the developers had to originally name it Star Radio Communicator in order to keep Paramount from sniffing out their brilliant effort. Get it now before those filthy media hacks set their phasers to kill on this one. 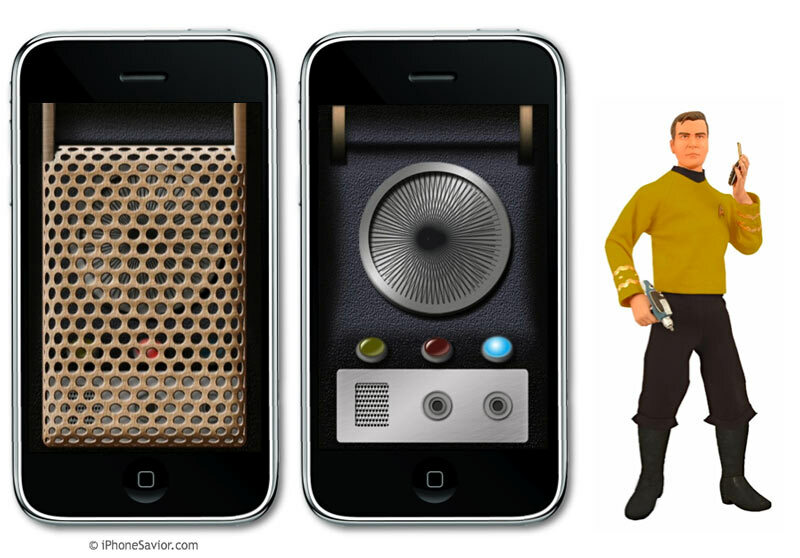 Nice app for a trek fan - not the real communicator sound board effects but who really cares, next you'll want to communicate with the real Enterprise NCC-1701 or else you'll want your dollar back!!! Like uncle Bill says "get a life"!! Will it ever be back? I want to try it! Not bad and the closest you'll get to a communicator on the iPhone, learn to love it!! However, the boys at CBS have pulled this off the iPhone app site and now it's gone - you people who had this and deleted it - HA. It will still be in your iTunes app cache if you downloaded it. So you should have no problem reinstalling it. I bought it, loved it, then it screwed up and when I tried to download it again, the iphone store says it's no longer available in the united states. wtf? I already paid for it!!!!! you spend a billion bucks on an iphone & contract and then moan about a dollar!? Should have read the comments before buying... very disappointed. Only lost $1 though, so lesson learned. This app is more about the total experience for me than it is about the exact sounds that some mega Trekkie geeks seem to require. Wouldn't that infringe on Star Trek copyrights? Star Wars vs Star Trek Thread! Damn it! Not the sounds I was expecting. What a waste. I want my money back. Why does zaphold and adfas sound like angry developers trying to kill the momentum of this genuinely cool app? hmmm. I spent a huge $.99 and dig this for the right reasons. Stay away! This has no real star trek sounds, and is therefore in my opinion, junk. I will be deleting it off my iphone and giving it a one star..
With the new voice controls, they will just have to figure out how to make it dial home when you say "Kirk to Enterprise".